With no comments from board members this week, the Sarasota City Commission took its second and final vote to approve a total budget of $228,971,436 for the 2019 fiscal year, which will begin on Oct. 1. On Sept. 17, Commissioners Shelli Freeland Eddie and Hagen Brody again cast “No” votes on both the budget and a higher citywide millage rate. They both have voiced opposition to staff proposals for increased spending. Mayor Liz Alpert, Vice Mayor Jen Ahearn-Koch and Commissioner Willie Shaw voted “Yes” on Shaw’s motions to approve the budget and the overall millage rate. 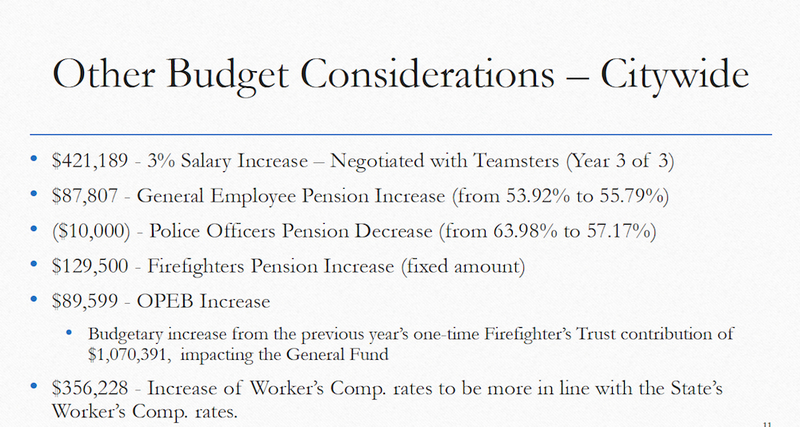 The city’s millage rate for operating expenses will rise from 3.1728 to 3.2632. City staff has noted that the owner of a home with a taxable value of $200,000 will be expected to pay an extra $18.08 in taxes. The city’s debt service millage rate for the new fiscal year is 0.2518, which is a decrease from 0.2745 mills in the current fiscal year. The combination of the city operating and debt service rates for FY19 is 3.5150 mills. Staff has explained that because the city will have to take over operations of five parks that Sarasota County staff has been managing, the higher operating millage rate is necessary to cover the net cost of that shift, which is anticipated to cost the city $914,546 in the 2019 fiscal year. “I think it’s just shocking … I think it’s just complete spin,” Brody told city Financial Administration Director Kelly Strickland on Sept. 4. The County Commission agreed in July to provide a total supplement of $2,645,046 to the city’s Parks and Recreation budget over the next three years, while the transition takes place. In July, both commissions voted to approve a new interlocal agreement governing parks management; the county board had sought that in an effort to improve the county’s budget outlook for coming years. The resolution the city commissioners officially approved on Sept. 4 and again on Sept. 17 said the new millage rate is 7.35% higher than the aggregate “rolled-back” rate of 3.1460. The rolled-back rate is the one needed to generate the same amount of property tax revenue the city received for the current fiscal year. As Strickland explained during her Sept. 4 presentation, the new budget will reflect an 8.87% increase in taxable property values in the city. Only one speaker addressed the board during its Sept. 17 public hearing — Martin Hyde, who routinely appears at commission meetings to express his views on topics. According to documents provided to the commission in advance of the meeting, the uptick in the taxable value of city property is expected to result in the city’s receiving $33,031,898 in ad valorem tax revenue. The city’s penny sales tax revenue has been estimated at $8,577,191 in the 2019 fiscal year, while the excise tax on city utilities is expected to generate $11,148,700. The city also is expected to receive $4,192,425 in Tourist Development Tax (TDT) revenue from the county. That money — which is allocated on the basis of a formula reflecting each municipality’s population count — is used for beach renourishment efforts. (See the related story in this issue.) At the end of the 2017 fiscal year, the city had $3,710,408 in its TDT fund balance, county records show. 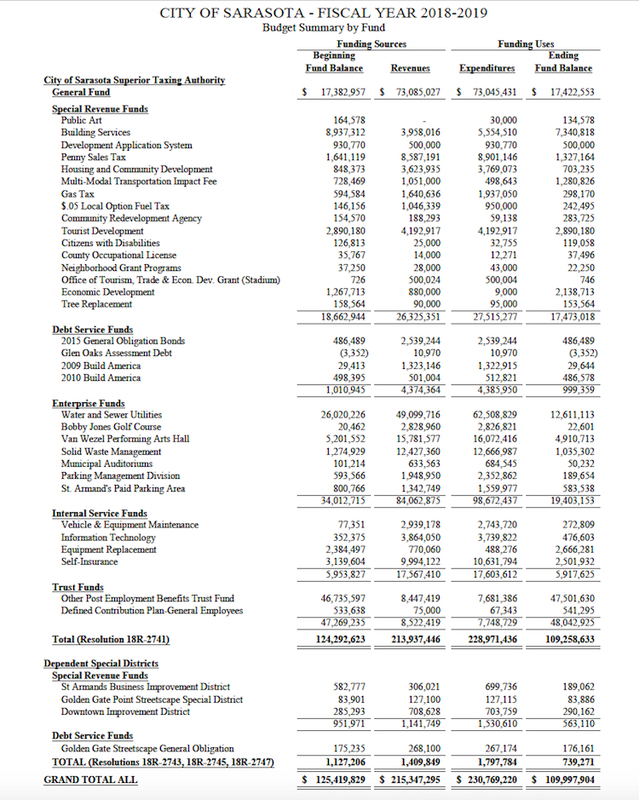 Total revenue for the city’s General Fund — which covers the operations of most departments, including the Sarasota Police Department — has been budgeted at $73,085,027 in FY19. Out of all city departments, the Police Department has the biggest budget. In 2019, the total has been put at $34,619,453.